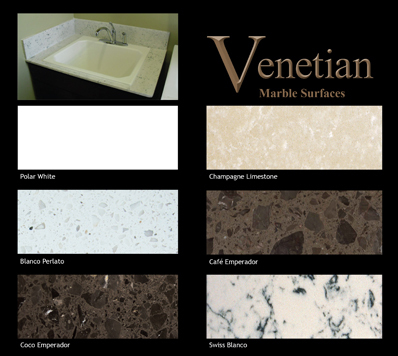 Venetian marble countertops are an ideal option for those looking for the elegance of marble and granite stones but desiring greater durability. This engineered marble surface gives you all the benefits of traditional marble slabs but at a fraction of the cost. Recycled natural stone is pressed and heated to create an environmentally friendly countertop option. Its engineered strength makes it much more resilient than cultured marble.